Aleks Riitmaa, known affectionately as Father Riitmaas, has beaten off strong opposition to claim the KP of the Year crown for 2018. The award is the brainchild of warewashing specialist Winterhalter and is judged by a panel of top names from the foodservice industry. 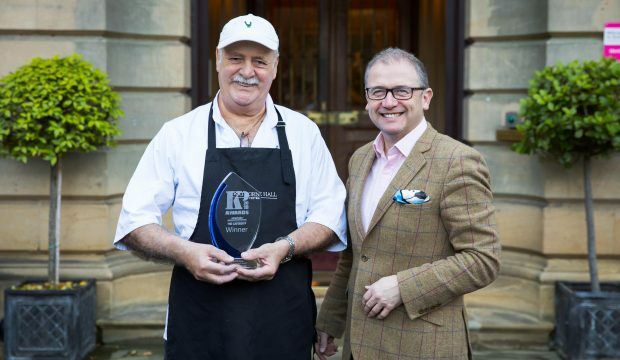 Aleks has been a kitchen porter at the Crathorne Hall Hotel in North Yorkshire for over eleven years and was nominated by Alan Robinson, the hotel’s executive head chef. “Father Riitmaas is thoughtful, generous, does the most thorough job and makes the whole team smile,” says Alan. “He cleans and scrubs areas that other KPs didn’t even know existed! He gets involved in the upkeep of everything, from the deep fat fryer to the compost bins and our bees. Stephen Kinkead is the managing director of Winterhalter UK. “We had a really tough time sorting out the runners up in this year’s competition, because the level of entries was so high,” he says. “However, picking the overall winner was relatively easy – Aleks was the unanimous choice, right from the get go. At one point Alan described him as ‘a unique inspiration’, and as judges we could really see why. Along with his trophy, Aleks wins £1,000 in cash, plus a celebratory dinner for family and friends. For the Crathorne Hotel his win means they receive a brand new Winterhalter warewasher. “The judging was so tough that we couldn’t pick just two runners ups – so for 2018 we had to have three,” says Stephen Kinkead. They are Suheil Ahmed, of Social Pantry, London; Martyn Dickers, of the Cardiff Marriott Hotel; and David Gadsby who is a relief kitchen porter for BaxterStorey. Each receives a trophy and £250. In addition, every single KP who was entered for the award receives an exclusive KP of the Year apron in a special presentation tin. The 2018 judging panel included James Horler, chief executive of Ego Restaurants and director of Patisserie Valerie, Ping Pong and Cartwheel Recruitment; Richard Davies, executive chef at Calcot Manor; Anne Pierce, chief executive of Springboard UK; Sara Jayne Stanes, chief executive of the Royal Academy of Culinary Arts; Hayden Groves, executive chef, BaxterStorey; Brian Hannon, co-founder and director of Super 8 Restaurants – owners of Kiln in Soho, Smoking Goat and Brat in Shoreditch; Mark Surguy, hotel manager, The Stafford, London and Stephen Kinkead, managing director, Winterhalter UK.